New solar panels are installed on Michigan State University's campus over the parking lot at Hagadorn and Service Roads pictured on Tuesday, Aug. 29, 2017. 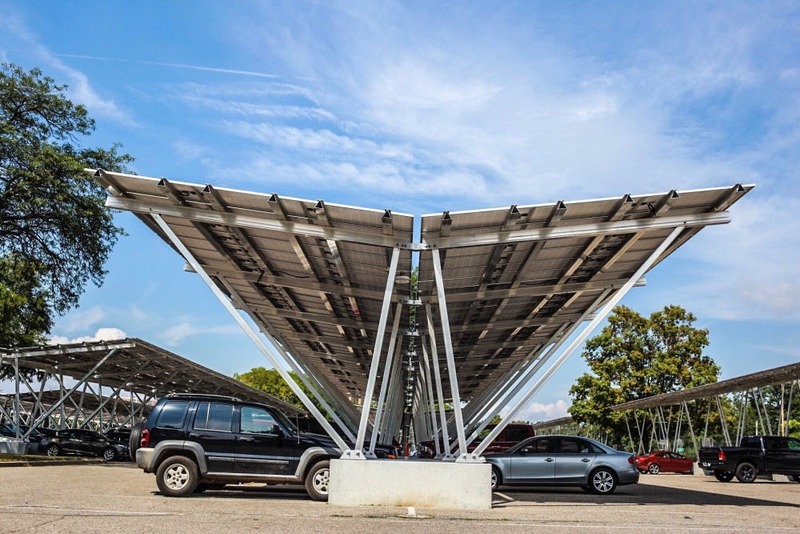 MSU is going greener than ever with new solar carports that’ll keep cars shaded and money in their savings. These new campus parking bays will accumulate energy from the sun, produce electricity and keep the air clean while protecting cars from heat, rain and snow according to physics professor and Office of the Executive Vice President Senior Consultant Wolfgang Bauer.According to Bauer, MSU has a 25-year power purchase agreement with the private company Inovateus Solar that says it will carry all the risks while MSU guarantees they will buy all the electricity that the solar panels use. “The peak power that the solar arrays, once they’re all done, will produce is about 18 percent of campus’s peak power demand,” Bauer said. There are currently four parking lots along Service road that are in various stages of being partially completed. Lot 91 on Hagadorn road already has solar panels up and by the end of the year all of the parking lots will be completed. “Throughout this fall semester there will be a huge effort on these parking lots and there will be one segment at a time will be closed,” Bauer said. Each individual unit is comprised of 3–by–6 solar panels. There are approximately 40,000 panels that cover 5,000 parking spots and an overall area of about 45 acres of land, according to Bauer. Inovateus Solar Account Executive Jordan Richardson remarked that MSU’s 13 megawatt solar panel project isn’t the largest their company has done, but is definitely the largest carport in North America. These solar panels will save the university about $10 million in electricity costs over the next 25 years, according to Bauer, and those savings could be available for other things, including better instructional spaces or even paying for teaching assistants. These solar arrays could produce enough electricity for almost 1,800 Michigan households and it is equivalent to planting 15,000 trees each year for the next 25 years, according to Bauer. Richardson called MSU’s thinking "very creative" because instead of digging holes in a random area to produce electricity, they are utilizing land that’s already consumed by students' cars every day.